In just the past few years, global asset values have risen to the biggest bubbles in history. Unfortunately, this doesn’t seem to be a concern to the market because most people believe they are getting richer. However, rapidly rising digital riches can easily turn into digital losses, just as quickly. But, this will likely remain a secret until the major fireworks begin in the markets by the this fall or within the next 1-2 years. According to a recent update by Savills, a global real estate services provider listed on the London Stock Exchange, global real estate values reached a new record of $281 trillion at the end of 2017. That is a BIG number because their last update in April 2017, stated that world real estate values were $228 trillion for 2016 yearend. How could global real estate values jump that much in a year?? Again, according to Savills for yearend 2017, global real estate values were $281 trillion, Securitized debt (treasuries-bonds) was $105 trillion, and total world equities were worth $83 trillion. Now, if you notice that GOLD SMUDGE on the right-hand side of the chart, that represents the total value of global gold and silver investments… a measly $3.1 trillion. And that figure really hasn’t changed in the past few years. Second, when I went to the Savills website to find out the percentage increase in these bubble asset values, I noticed that they stated global real estate values increased 6.2% over the past year. You can check for yourself here: 8 things you need to know about the value of global real estate. Well, something just didn’t make sense if Savills showed that global real estate values increased from $228 trillion at the end of 2016 to $281 trillion by the end of last year. Gosh, that can’t be a 6.2% increase… rather it was a stunning 23% increase. So, I decided to email the author of the article and find out why these numbers didn’t jive. Fortunately, she was kind enough to respond to my email and let me know that I was quite right. Even though Savills stated that global real estate values only increased 6.2% year-over-year, the much higher $281 trillion figure was due to “refining their methodology and including value revisions.” Basically, Savills revalued global real estate by an additional $39 trillion, not including the $14 trillion based on a 6.2% annual increase. As you can see, Securitized Debt increased from $100 trillion to $105 trillion, but Equities shot up the most by $13 trillion… $70 trillion to $83 trillion. So, if we add up all the values of global real estate, securitized debt, and equities, it equals a stunning $469 trillion. 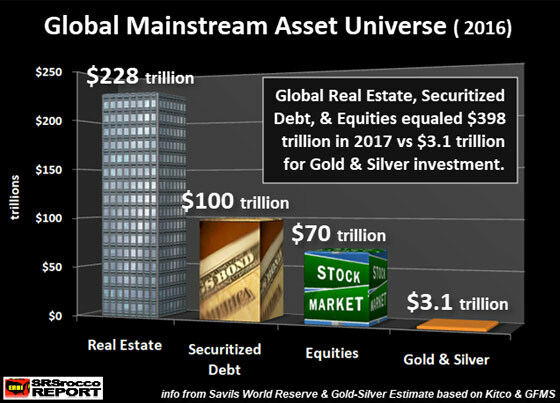 Which means, total world gold and silver investment of $3.1 trillion now accounts for 0.6% of global assets. That’s correct; it’s not even 1% anymore… LOL. 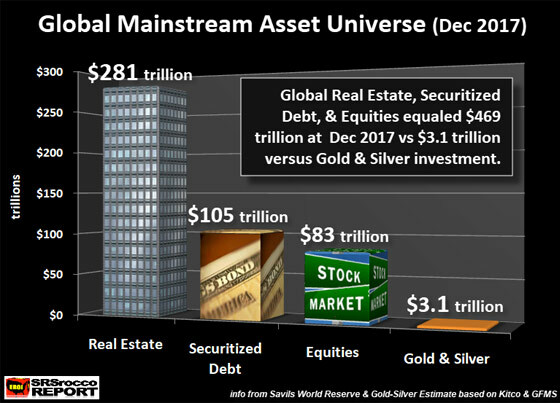 So, while global real estate, equities and securitized debt increased by $103 trillion in the past two years, world gold and silver investment has virtually gone NOWHERE. 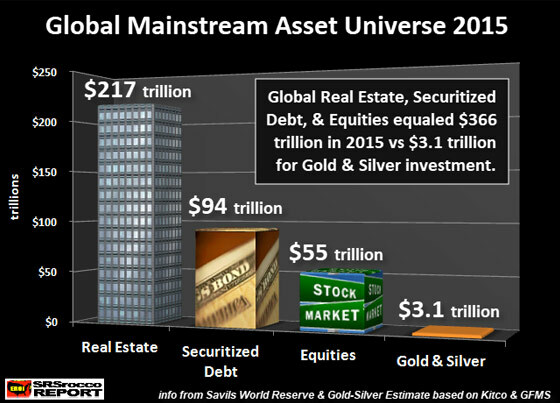 Yes, it seems quite strange that gold and silver investment has remained at $3.1 trillion, but I have done the math. In 2015 the average gold price was approximately $1,200 an ounce, and today it’s about $1,200 an ounce. As for the silver price, it was about $15.50 (average) in 2015 and its trading at the same level today. Even if we add two years of additional gold and silver investment demand, it doesn’t change the overall $3.1 trillion figure. When I did the gold and silver investment figures back in 2016, it may have been something like $3.06 trillion and today its $3.12 trillion. Thus, when we round up the numbers, it’s still right at $3.1 trillion. But, we don’t need to round up the global real estate, securitized debt, and equity values as they have jumped over $100 trillion in just two years and are now in EXTREME BUBBLE territory. How can global equity (stock) values surge by $28 trillion in two years ($55 trillion to $83 trillion), a massive 50% increase, if global oil consumption has only risen by 3 million barrels per day, or a lousy 3%??? According to the IEA – International Energy Agency, total global oil demand increased from approximately 95 million barrels per day (mbd) in 2015 to 98 mbd in 2017. Please understand, the world isn’t producing 98 mbd of high-quality conventional oil. That figure 98 mbd figure includes shale oil, oil sands, NGL’s – natural gas plant liquids and biofuels. If investors paid attention to the ENERGY, they would realize these global asset values (not including precious metals) are severely overvalued. I believe that within a decade, current global real estate, securitized debt, and equity values of $469 trillion will have lost at least 50% of their value. If just $1-$2 trillion of this amount made its way into precious metals, it would push the value of gold and silver to levels never thought possible. I am not talking HYPE here, but logic. My analysis suggests that global oil production will begin to decline as U.S. shale oil production disintegrates, starting within the next 1-2 years. I forecast U.S. domestic oil production to be down 50-75% by 2025. If the country falls into a deep depression, with oil prices below $30, then we could see U.S. domestic oil production down by the 75% in just seven years. But, if the economy enters into a recession, but still plugs along for a while, then I see U.S. oil production only down by 50% during the same period. Regardless, U.S. oil production will continue to decline and it will likely be down 75-80% by 2030. Thus, the United States will look like a much different place by 2030. If Americans do not diversify some of their wealth into the “Safe Havens” of the precious metals, they will likely lose a great deal of DIGITAL WEALTH.